I'm all about weeknight dinners that are fast and hassle-free. Bonus points if they are healthy and nutritious! This recipe was taken from Jamie Oliver's 15 Minute Meals. The book had some amazing recipes (and beautiful photographs), but I was skeptical about how fast a home cook could make these meals. For me, the whole process (sardines plus salad) took about 30 minutes, between prepping the sardines and vegetables, blending sauces and taking photos of everything. But nonetheless, super fast meal! I will share with you the Grilled Sardines first, and the Tuscan Bread Salad in another post. When I made this meal, I dealt with the sardines first, and started on the salad when the sardines were in the oven. The two dishes were done pretty much at the same time. I forgot to buy chilis at the market but luckily we had some growing in a pot outside our home! However they weren't fully grown yet and were super tiny. I decided to add them in anyway. The sauce consisted of spring onions, parsley, salt, olive oil, lemon juice, and chilis. For those who hate parsley, you will be glad to know that this sauce came out light and citrusy. The parsley was not overpowering. Spread the mixture on a pan just large enough for the sardines and lay the sardines skin side up. Sprinkle the pancetta around. You can omit the pancetta, but using just a tiny bit won't do too much damage! It adds a nice smoky flavour and crunch to the dish. 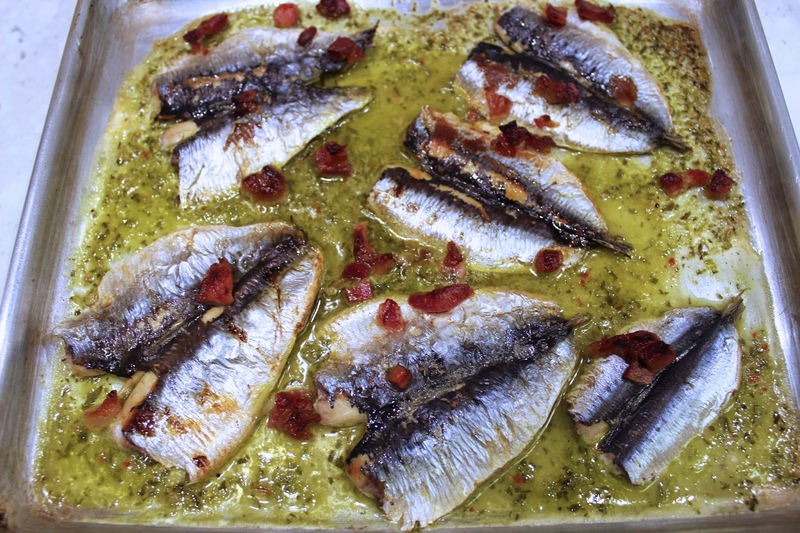 After a quick 8 minutes, the sardines will be nice and crispy on top, moist and flaky on the bottom. 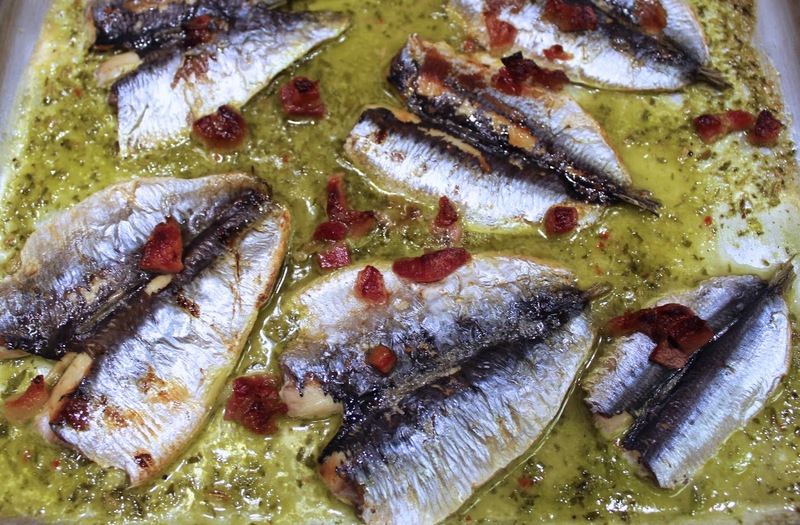 I served the sardines just like that in the pan with the beautiful green sauce. Verdict: I will definitely make these sardines again, but with regular sized chilis. My dish was missing a bit of heat. Set your oven grill onto high. Put the spring onions, chilli, parsley, fennel, lemon juice, salt and olive oil in a processor, and blend until it forms a paste. 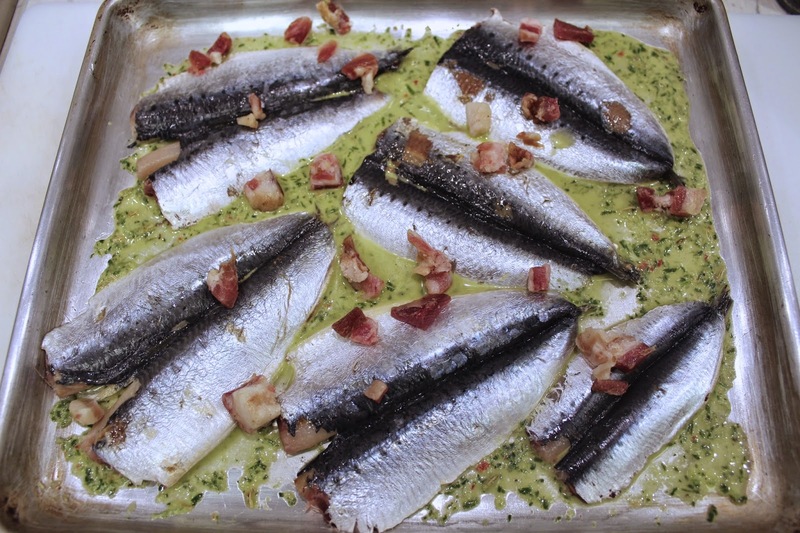 Rub the paste onto a baking tray and lay the sardines on top, skin side up. Dot the pancetta throughout the sardines. Grill until golden and crispy, about 8 minutes.